After years of hard work promoting the City of Langley's Downtown Master Plan, yesterday afternoon a new 15-storey, mixed-use development may be coming to the corner of Industrial Avenue and 203rd Street. 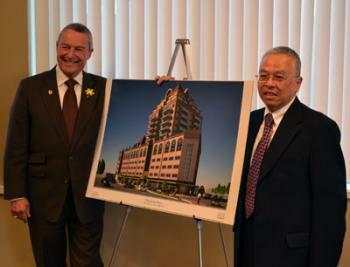 Mayor Peter Fassbender and Developer David Phan, launching development. According to the developer, this project called Charleston Place has been in the works since 2005. The building will have ground-level retail, 5 storeys of professional space, and 9 storeys of residential units. 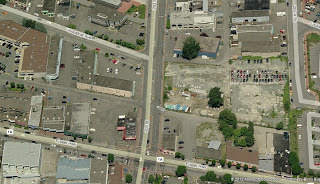 Similar to some developments in New Westminster, parking will be a above-ground and underground. This project will complete in 2015. Low-Density Strips at 203rd and Industrial may become become a high-density and mixed-use. If this development proceeds, it will certainly set the tone for other projects in the City and its downtown core. This sort of development combined with transit will certainly set the City of Langley on the path to sustainability. I will be following this development closely. Very happy to see this type of development in the City of Langley. I think it will definitely help bring in more development to the downtown area and stimulate the growth plan. Like this type of development but am very concerned about the design. I dont feel it fits in with the style of development laid out in the downtown master plan. I think something more modern with a yaletown feel would set the right tone for this type of development and not be an eyesore for years to come.